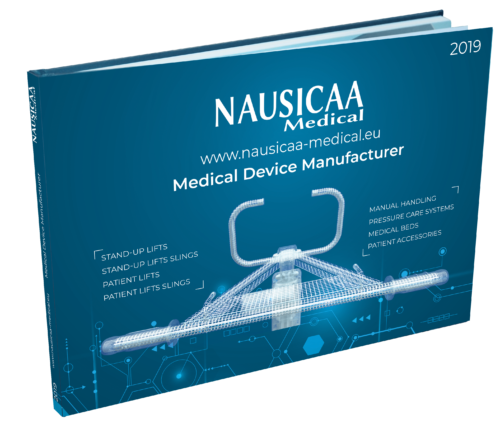 Our 2019 Product Catalogue will help you discover a complete range of patient lifts and stand-up lifts for all patients (and conform to European Standard NF EN ISO 10535:2007), a wide range of medical beds and a comprehensive range of patient positioning. Hard copies are also available by post, please send an email to export@nausicaa-medical.com in order to obtain one. Find our Stand-Up Lifts which are useful and effective when a patient has a certain degree of dependence coupled with a caregiver need for basic care as they allow the patient to be raised from a bed, a chair rest, a toilet or a wheelchair in order to be transferred while being active. Encouraging patients’ mobility, theses devices are most suitable for patients having difficulty to stand up while allowing patients in care environments to acquire physical and psychological benefits while preserving mobility, independence and dignity. Discover our Patient Lifts which are useful and efficient when a patient is dependent and therefore needs a caregiver to perform basic care as they allow them to be transferred from a bed, a chair, a toilet, a wheelchair or from the ﬂoor in an easy and efficient way. They allow patients in care environments to acquire physical and psychological benefits while preserving mobility, independence and dignity; considering that they provide the most appropriate solution for the basic tasks of patient handling, lifting and repositioning. Furthermore, our Patient Positioning range participates in the search for a good posture of patients while preventing falls, is CE certified and is in compliance with REACH legislation. The purpose of positioning is to provide a stable and comfortable support for patients confined to a chair or a bed, as its design makes it easy for everyday use and the choice of fabrics makes it comfortable, while being safe. Our range is developed in partnership with health professionals (occupational therapists and physiotherapists) in order to ensure the best possible support for the patient as well as a quick and easy installation for the caregiver.